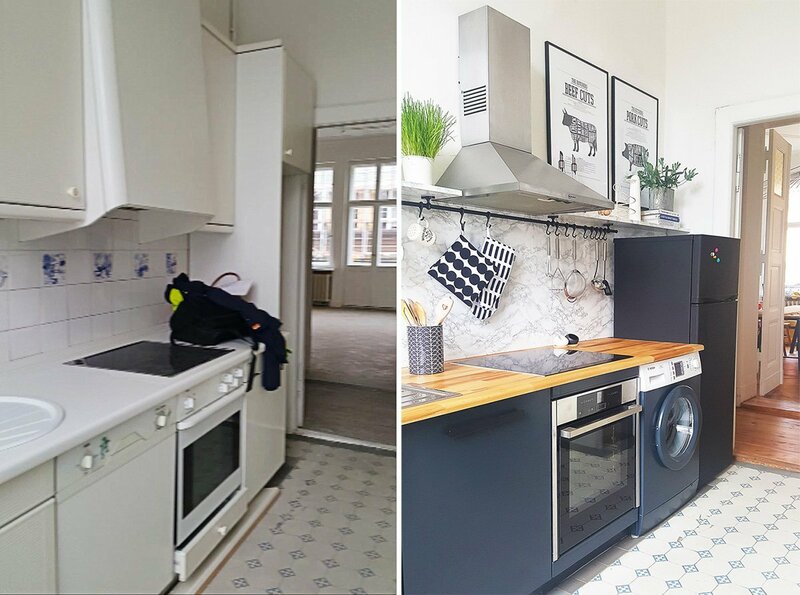 As you probably know, we gave our kitchen a dramatic makeover earlier this year and turned it from a bland and boring space with plain off-white cabinets into a modern and way more stylish tuxedo kitchen (yep, that’s actually what they’re called!). We absolutely love how it turned out and painting it was one of the best home improvement decisions we’ve made so far! Painting is always one of our favourite projects to do. 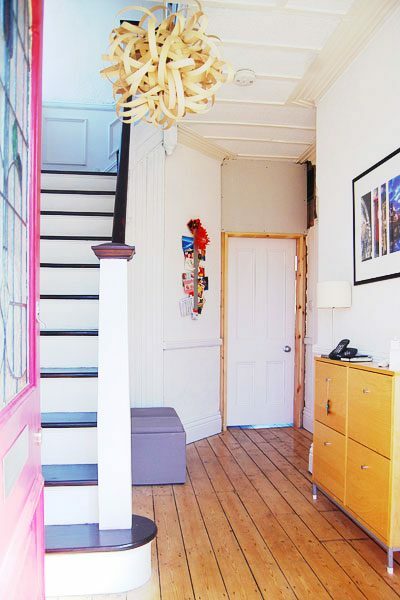 It’s easy, cheap and such an effective way to transform a space. Painting walls and ceilings is really straightforward but we had a few concerns about painting our cabinets. Would the finish hold up? Would it be easy to do? Would we manage to achieve a flawless finish? Is painting laminate kitchen cabinets really a good idea? Well, I’m happy to say that they turned out amazingly well. As always though, the true test is seeing how the finish holds up over time. Our cabinets have been painted for over 7 months now and I’m happy to say that they look exactly as they did on the first day! 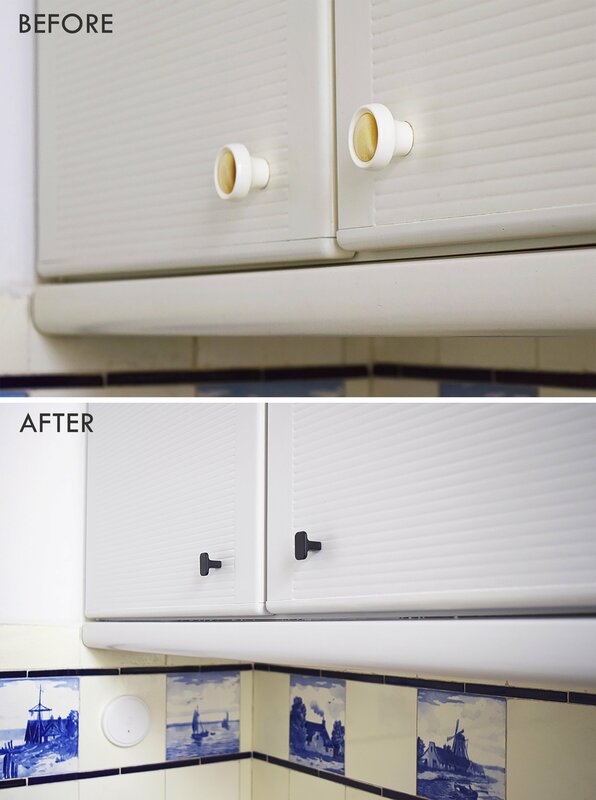 There’s not a scratch or mark in sight, even in areas that get a lot of wear and tear like around the handles or edges of cupboard doors. I honestly couldn’t be happier with how it looks and how it’s holding up! 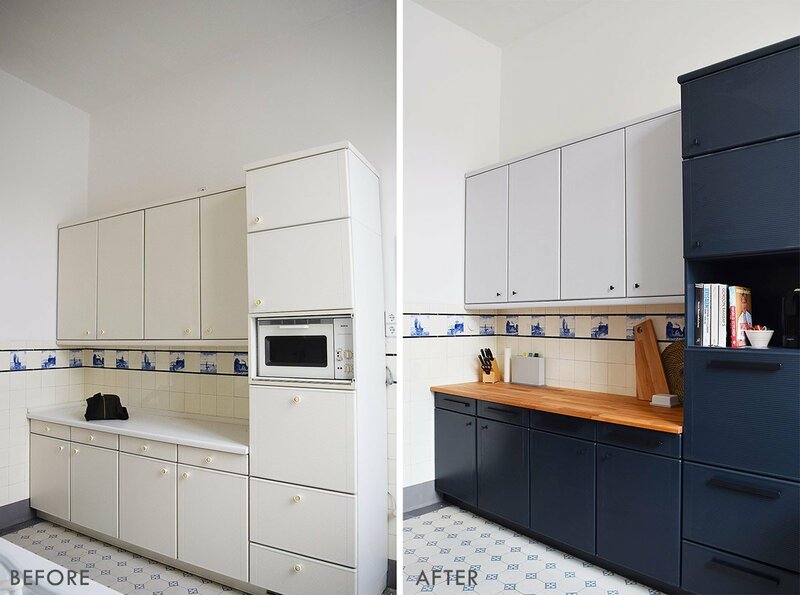 I’m totally aware that painting kitchen cabinets can seem like a daunting thing to do – we definitely had our concerns – but it’s not as difficult as it may seem and achieving a flawless finish where you wouldn’t know that it’s painted is possible! With all of that said, here’s a flowchart to give you an overview of what’s involved when painting kitchen cabinets. 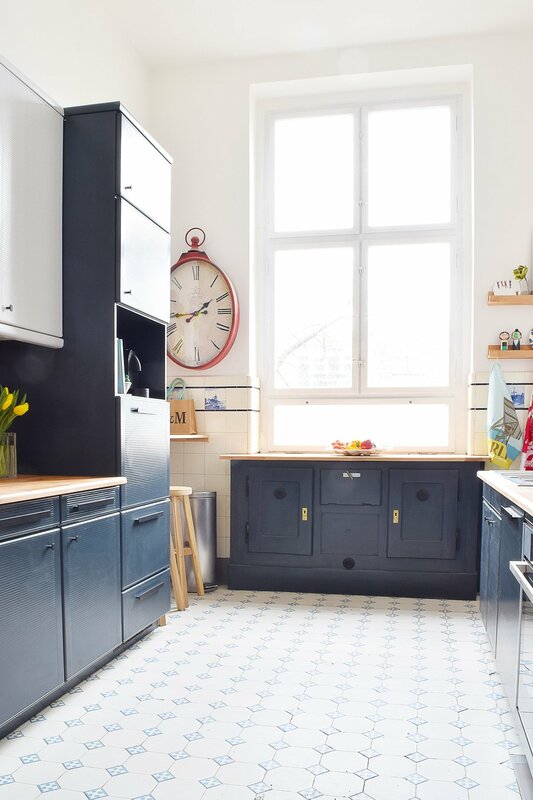 And, if you’re planning on painting your kitchen cabinets, we’re also sharing a helpful step by step checklist that you can download at the end of this post. 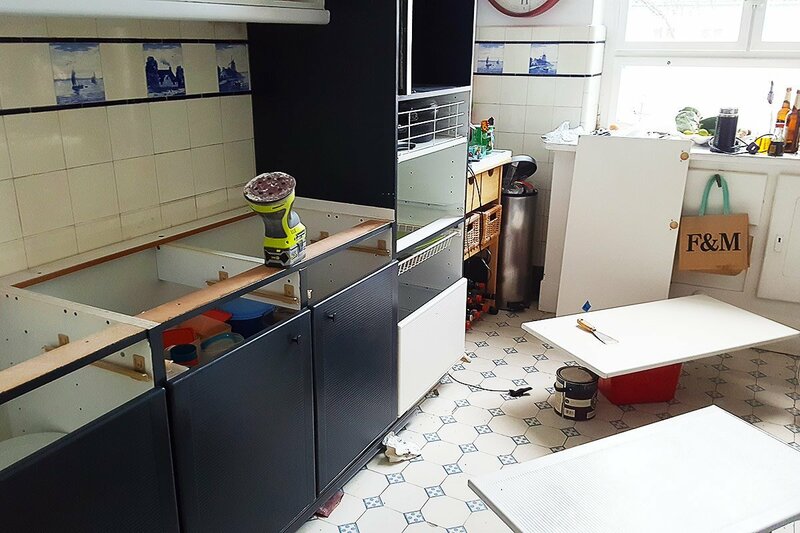 The most important step when painting your kitchen is planning and preparation. What is your kitchen made of? Is it solid wood, laminate, or something else? Has it been previously painted? All choices you make will depend on what your kitchen is made of and what condition it’s in! Our cabinets have a laminate finish which means that they’re really smooth and getting paint to adhere to them can be tricky. The secret to achieving a long-lasting finish is sanding and using the right primer. 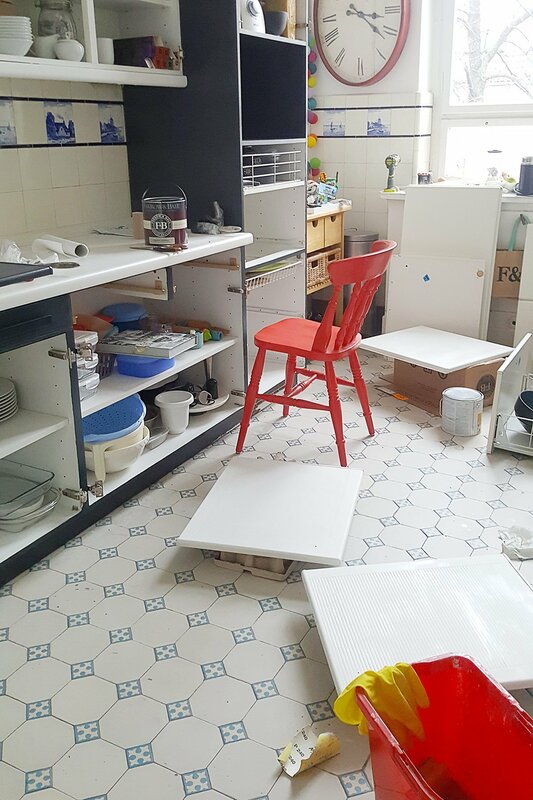 Before starting to do any painting or sanding we gave our cupboards a very thorough clean. We always use sugar soap for cleaning cupboards and furniture we’re going to paint as it’s really good at removing all grime and grease which is obviously especially important in a kitchen! We also took the cupboard doors and drawer fronts off the cabinets before painting and also removed all handles. Even if you’re planning on using the same handles again, we’d definitely recommend removing them because it’ll make the whole sanding and painting process much easier. I say it every time we paint something but I honestly can’t emphasise enough just how important sanding is! It makes the difference between an okay finish and a professional and long-lasting finish. 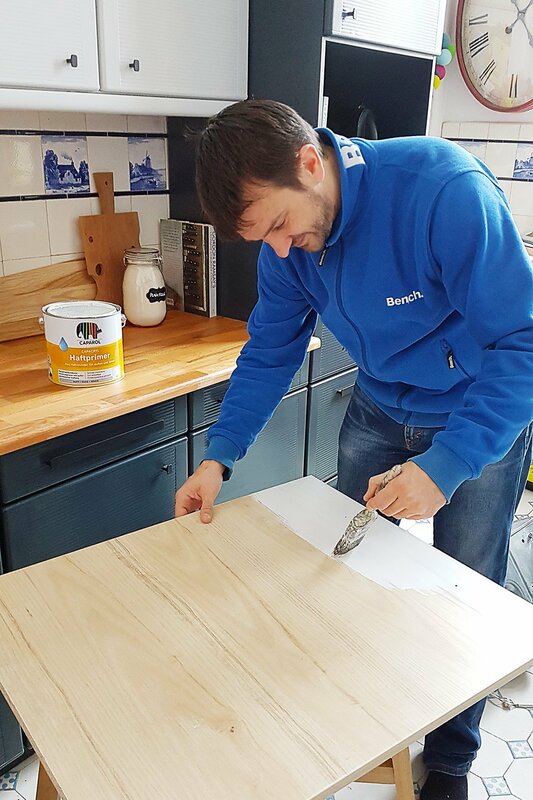 And sanding isn’t just important before you apply the primer – you have to sand after every coat of paint! Sanding makes lots of tiny grooves for the paint to stick in therefore ensuring a longer lasting finish, sanding removes any imperfections (both before painting and after painting) and sanding leaves a super smooth and professional finish. In terms of paint and primer, there are so many options that choosing the right paint can seem overwhelming. 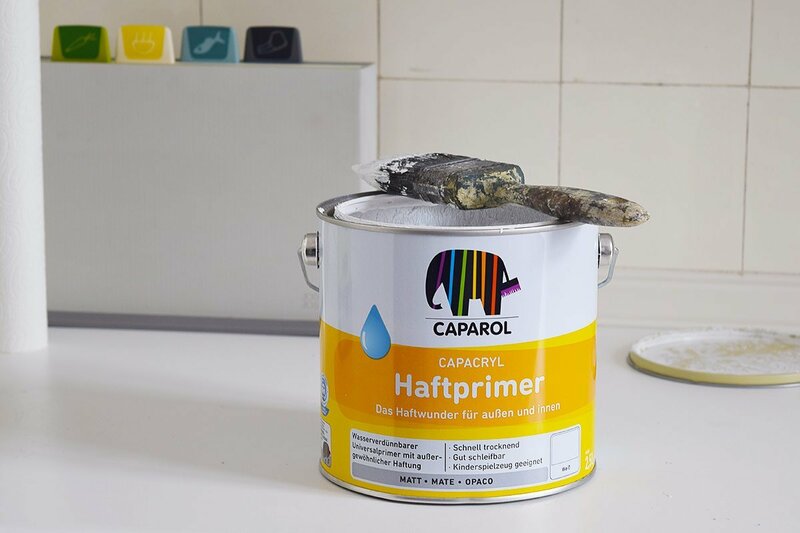 There are specialist paints for pretty much everything! To be able to paint the super smooth laminate you’ll need a primer with adhesion promoting properties. 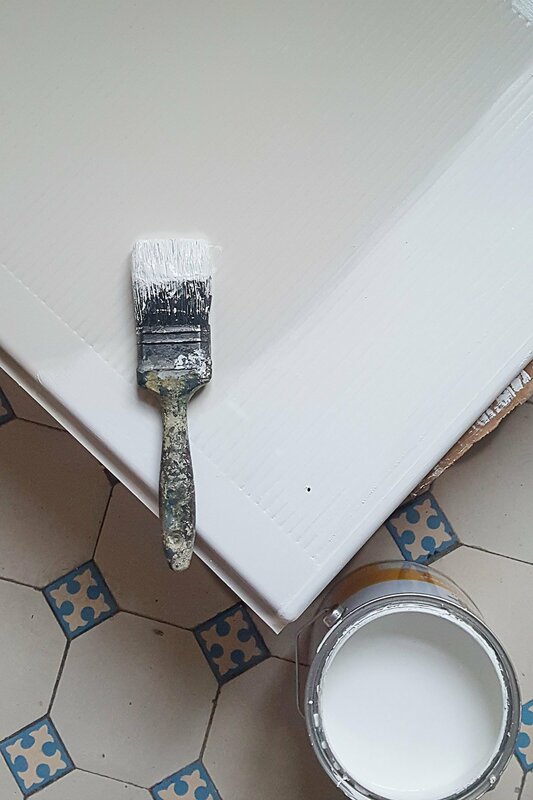 The right primer will stick to the surface and provide the perfect base for your chosen paint finish. We did a tone of research on primers and this is the primer that we eventually used and are really happy with but any primer with adhesion promoting properties should do the trick. A good alternative seems to be Zinsser Bulls Eye 1-2-3 (although we’ve not tried it ourselves). 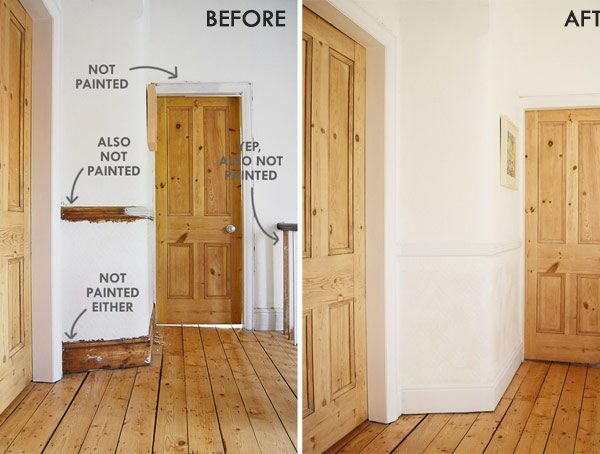 In terms of paint, any high-quality paint that’s suitable for painting wood will be fine. Just be sure not to choose a completely matt finish as it’ll show up every greasy fingerprint! 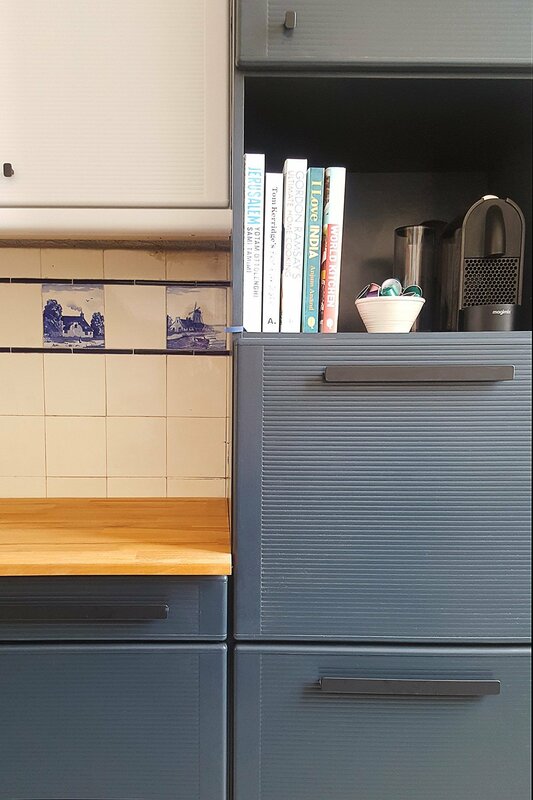 We used Farrow & Ball Wood & Metal paint in Estate Eggshell (the dark cupboards are Railings and the light cupboards are Dimpse). No matter how good your primer and paint are the other vital step is sanding your cupboards. I know that there are lots of tutorials out there saying you can paint without sanding but honestly, don’t even think about it. If you’re too lazy to sand, there’s no point even doing the project in the first place. It’s vital to achieving a long-lasting finish! Before painting the cupboards we gave them a sand with 120 grit sandpaper. Being lazy as usual, we used our orbital sander but you could totally sand by hand. You only have to roughen up the surface so it shouldn’t take more than a couple of minutes per cupboard door even if you sand by hand. Then clean the cupboards and make sure they’re completely dust and dirt free before giving them a coat of your chosen primer. When the primer has dried give the door a light sand with some fine sandpaper (around 240 grit). This will remove any imperfections and create more grooves for the next coat of paint to stick to. It’s really important to sand between every coat of paint!. This ensures that each coat of paint sticks to the previous one and helps achieve a perfectly smooth and flawless finish. I always prefer painting with a brush but you can, of course, use a roller, too. It probably goes without saying that the quality of your tools makes a huge difference to the end result of your work. We still have the same paint brushes that we bought just after moving into our first home (over 8 years ago now!) and they’re still in great condition! Keep repeating the painting, drying and sanding process until you’re happy with the coverage of your paint. It’s always best to apply lots of thin coats of paint rather than one thick one. This will result in a much more even finish without the dreaded visible brush strokes! After you’ve finished painting and everything has dried give your cupboards one last sand with super fine (about 400 grit) sandpaper or some fine steel wool. This will remove any tiny imperfections and leave you with a super smooth and professional finish! There’s really no need for something that’s painted to actually look painted! 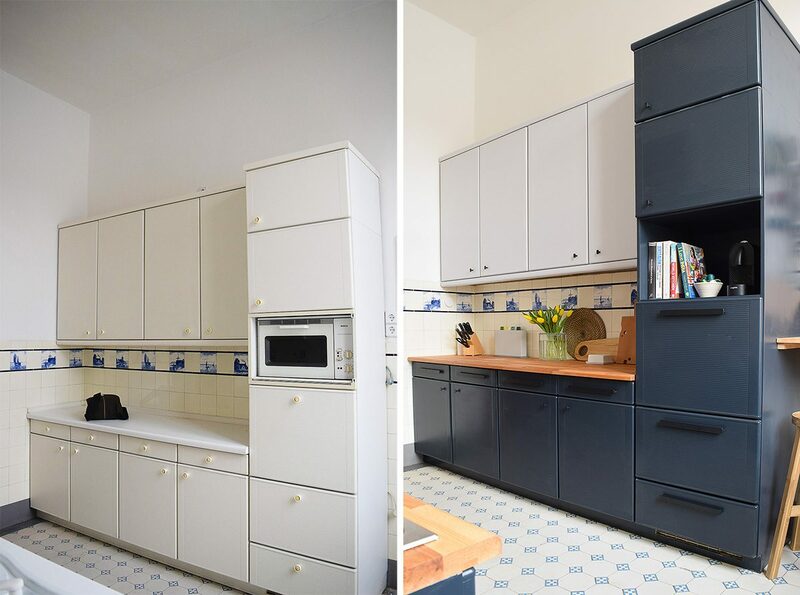 All that’s left to do is attach your handles (new handles can already make a huge difference to the way your kitchen feels) and re-attach the doors and drawer fronts before enjoying your new kitchen! If you’ve not already guessed it, use the right products is vital. Using an adhesion promoting primer will provide the right surface for your chosen paint finish to stick to. Don’t use chalk paint and don’t use matt paint as it’ll show up every greasy fingerprint. 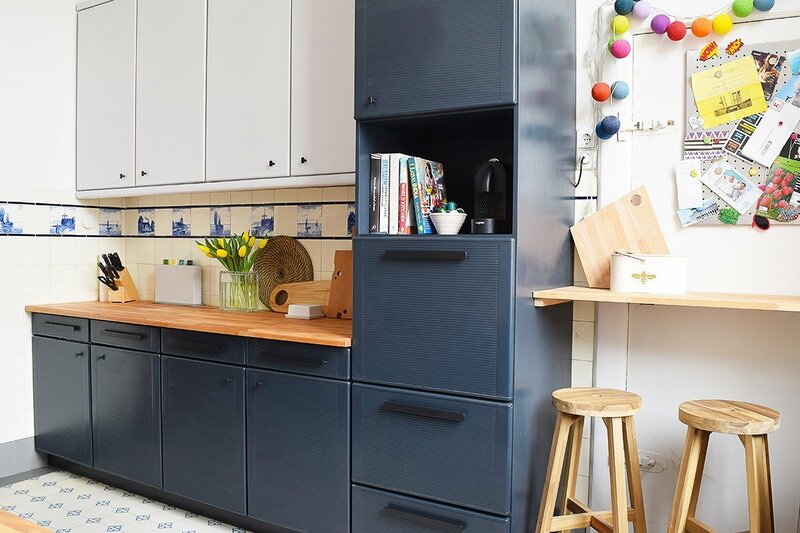 Use a high-quality paint to paint the cupboards as it’ll be more durable and less likely to chip. Yes, I know I’ve already gone on and on about sanding but it really is that important! Sanding before you apply the first coat of primer is important but sanding between each layer of primer and each layer of paint is equally important. It really is the only way to ensure a flawless and long-lasting finish! Just as important as the products you use are the tools you use. Invest in quality brushes – there’s nothing worse than painting with a brush that loses its bristles! Make sure to also use the right brushes for the paint you’re using. There are different brushes for solvent based and water based paints and they really do make a difference! It’s important to wait for each layer of paint to thoroughly dry before you move on to the next. If you start sanding or painting too soon it’ll mess up your paint finish. It’s also important to be careful for the first couple of weeks after painting. It takes a while for the paint to fully cure and the finish can easily scratch or chip while the paint is still soft. I’ve probably made painting a laminate kitchen sound way more complicated than it is and it’s really no different than any other painting project! You really wouldn’t know that it’s painted and a few people actually thought we’d bought a new kitchen! 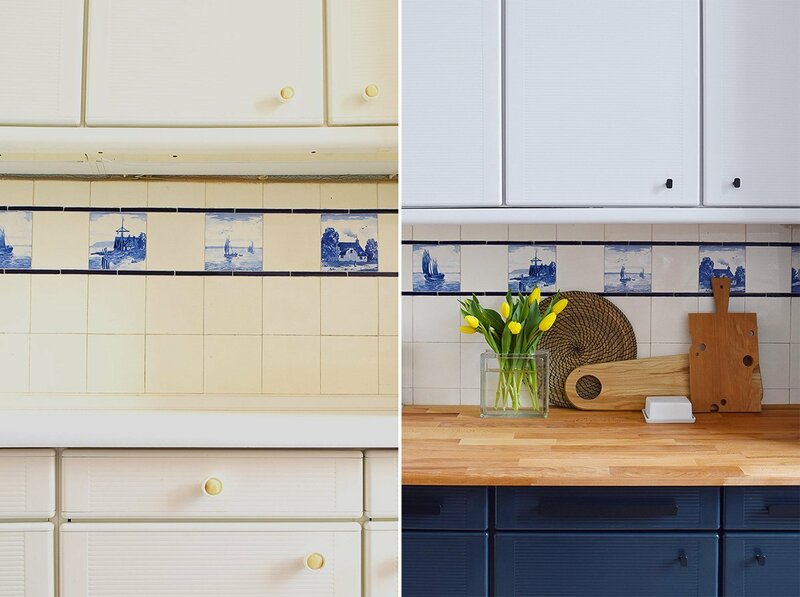 Have you ever painted a kitchen? – We’d love to hear your experience! 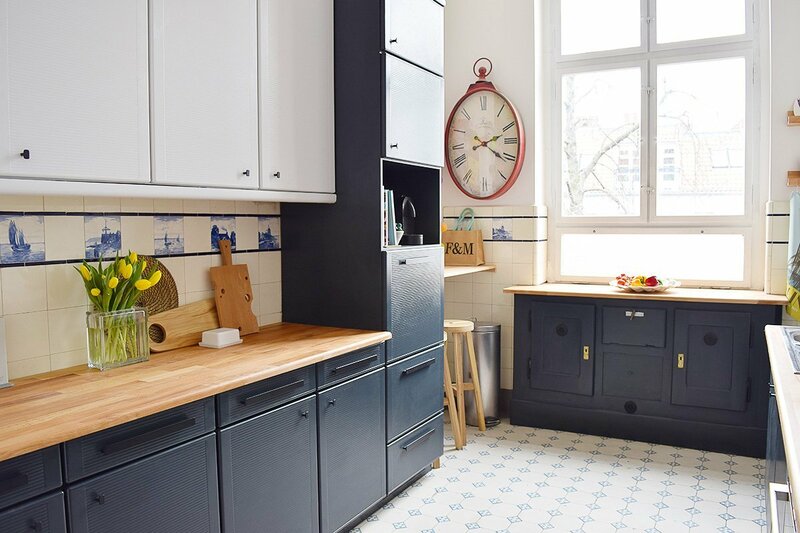 Are you a fan of tuxedo kitchens? What would your dream kitchen look like? PS. Here are some of our other kitchen projects! next article: Why We’ll Be Moving Again + An Exciting Blog Award Nomination! Kitchen looks great! A small tip, putting long (spent) match or toothpick in screw holes prevents them clogging up with paint. Thank you & thanks for the great tip, too, Lucy! You’d be welcome any time if you should make it to Berlin one day! My big adventure this Sept is 5 nights aboard https://www.sthildaseaadventures.co.uk/our-vessels/seahorse-II-a-small-ship with power wheelchair! Oh, wow! That looks amazing – I’m sure you’ll have an amazing time! Great work! It’s incredible how impactful a paint job can have in a room! Thanks! It’s always amazing what a difference a bit of paint can make!